Create instant storage space on any flat, metal surface. Create instant storage space on any flat, metal surface. Use Magnetic Storage Pockets on classroom white boards and office filing cabinets to create instant storage space. Pouches feature a 2 inch gusset, which expands for additional capacity. The hook and loop closure allows for contents to remain secure during storage. Each pouch features a white write-on panel that allows the pockets to be labelled, helping identify what is stored inside. Pockets are 9-3/4 x 6 in size, making them the perfect size to store anything from dry erase markers to smaller office supplies like paper clips and rubber bands. Available in a set of four, the storage pockets come in assorted colors, including orange, turquoise, red and purple. Hi, I'm Cheryl with C-Line and today we're going to talk about our Magnetic Storage Pockets with a Write-On Panel. C-Line's Magnetic Storage Pockets are the perfect solution for creating extra storage space on any flat, metal surface. Available in four assorted colors, the Magnetic Storage Pocket has a write-on dry erase panel so you can identify what's stored inside. You can write on it and then wipe it right off. Each pocket is 9-3/4 x 6 and has a 2 inch gusset that expands to hold your dry erase markers, first-aid items, small office supplies and more. The hook and loop closure keeps everything safe and secure. 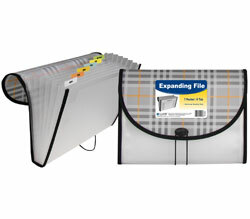 C-Line's Magnetic Storage Pockets are excellent for classroom whiteboards, filing cabinets and any metal surface. They are great for organizing your home, school and business. Order yours now! That's all we have for today. I'm Cheryl with C-Line. Thanks for watching.